Plum Health DPC is teaming up with Veterans Care Network to provide affordable, accessible healthcare services to those who have served in the military. Veterans Care Network has set aside some funding to sponsor a few Veterans and help them receive primary care services. They chose to use Direct Primary Care because they know how valuable the services in the DPC model can be. At Plum Health, we’re passionate about serving veterans and providing excellent healthcare services to all people, but especially those who have served our country. One of the biggest concerns that my patients who are Veterans have is the level of customer service at the Veterans Administration hospital. We rectify that issue by focusing our care on the patient and making sure that they not only have excellent healthcare, but also an excellent experience. We’re excited to partner with Veterans Care Network, and if you’d like to apply for this opportunity, follow this link. Veterans Care Network and Plum Health DPC team up to provide Direct Primary Care services for Veterans in Detroit, Michigan. 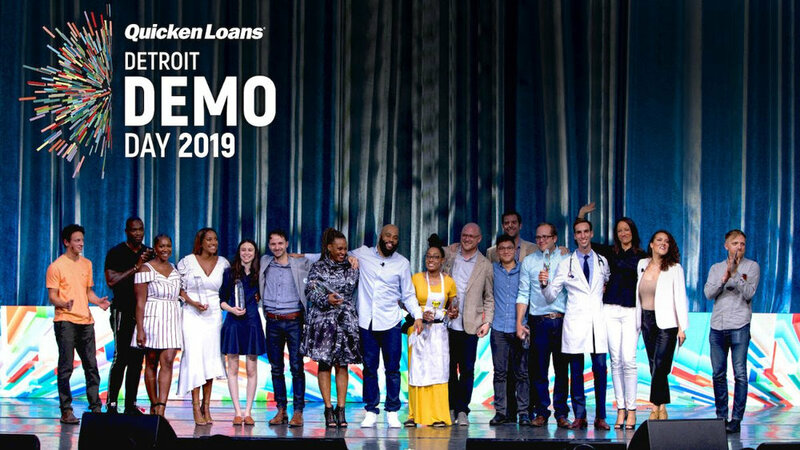 I'm posting this today because the application is now live for the next Quicken Loans Demo Day Event! Read more about our big win, here, and read more about Demo Day and the application process, here. If you’re a small business in Detroit and wanting to grow and expand your business, this is a fantastic opportunity to get more recognition in the community for your brand and your business, and if you have everything in order, you could potentially walk away with grant funding for your business or an interest-free loan from Quicken Loans. This review company, called Top Rated, accumulated all of our positive reviews online and published them on their website. 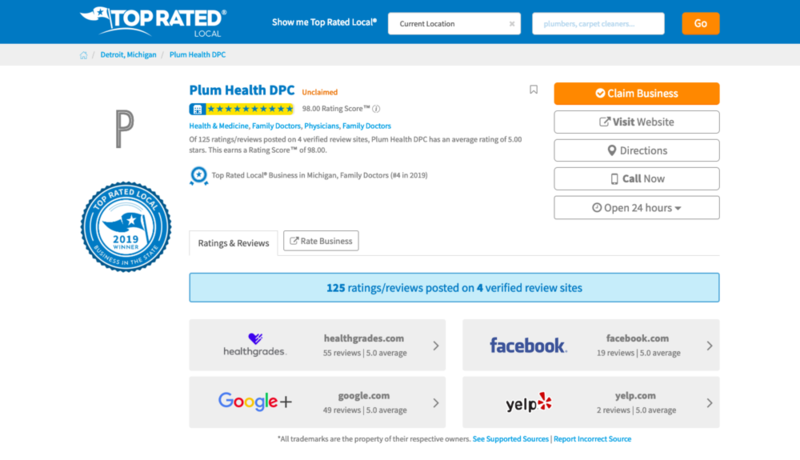 Plum Health DPC is a Top Rated Family Doctor and Primary Care office in Detroit, based on the above review site. Reflecting on this, I’m proud to provide an excellent service to our members at Plum Health and to the greater community. We really focus on going above and beyond for our patients, listening fully to their concerns, and doing whatever we can to guide them to better health and wellness. We are pleased that our reviews online reflect this ethos. Last month, we were up to 49 Five Star reviews on Google, which is a great feeling. It validates the work that we do - people come away from our practice knowing that service is valuable and wanting to share that knowledge with other people. This week, we crossed a threshold and received 50 Five Star reviews on Google! I love being a doctor and I love being a Direct Primary Care doctor. Because of the Direct Primary Care model, I have the opportunity to go above and beyond for my patients. For example, one of our members sent me a text message asking if I could bring by their medications the next day. I asked if I could drop them off that evening instead. Text conversation with my of our Plum Health DPC members about the medication drop off. I wanted to get them over as soon as possible because earlier that week, my patient had let me know that they were running low on their medications and on a tight schedule before an upcoming trip. That lead me to make an evening drop off of the medications on my way home from the office. Dr. Paul Thomas of Plum Health DPC drops off medications for one of the Plum Health DPC members. When members of our practice need something, we try to get it done for them right away. This is just one example of the many ways that we try to make health care more affordable, accessible, convenient, and personalized. What is a Plum Health Membership? What does it mean to be a member of Plum Health dpc? What’s involved in being a member of Plum Health DPC? We hear this question often. So, it’s worth taking some time to address it head on. Plum Health is a family medicine service run by Dr. Paul Thomas. Our mission is to deliver affordable, accessible healthcare. We are unlike other offices in several ways. We highly value the doctor-patient relationship and we routinely spend thirty minutes to one hour with each of our patients per visit. This time together is essential because it allows us to build a trusting relationship. When you’re a member of our practice, when you’re a member of Plum Health DPC, you have the opportunity to build this trusting and healing relationship with Dr. Paul Thomas over time. In contrast, at a typical family medicine office in the fee-for-service or insurance-based system, doctors prioritize seeing as many patients as possible to increase their payments from insurance companies. This is why you may only have five to twelve minutes with a primary care doctor in the insurance-based system. Being a member of Plum Health means that you’re committed to being a part of the membership model. If you’re looking for a one-off visit or one-time services, Plum Health probably is not the right fit for you. However, if you’re looking for a dependable physician who is responsive to your calls, texts, and emails at anytime of day, who cares about you as an individual and not as another number, then Plum Health DPC will be a great fit for you. Furthermore, we love taking care of people who believe what we believe - that health care should be individualized, that the doctor-patient relationship should be strong and seamless, that health care should be affordable and accessible. If you value these tenets like we do, then we’d love to have you as a part of the Plum Health DPC membership. How much does a plum Health DPC membership cost? A membership with Plum Health DPC costs $10/month for children, and starts at $49/month for adults. We have our full pricing structure here. With that membership, you can visit the office anytime without a copay. You also can call, text, or email the doctor anytime. Additionally, members of Plum Health DPC are able to get wholesale medications, at-cost labs, and at-cost imaging services at a fraction of the typical cost. How do I sign up for a Plum Health DPC membership? The signup process for Plum Health DPC is an easy one. Our online form takes about 5 minutes to complete. The form will ask for a credit card to complete the registration. Your card will not be billed until your account is confirmed by our staff and an appointment is made. We want to make sure you’re a good fit for our practice before we start billing you for the service. Thanks for reading and for watching, and have a wonderful day. Is Direct Primary Care the Cure for Our Broken Healthcare System? Is Direct Primary Care (DPC) the Cure for our Broken Healthcare System? That's the question that Caitlin Morse, PMP posed to me after reading my book with the same title (link to the book). Direct Primary Care (DPC) is a growing model of health care across the Nation, but does it live up to the hype? This is the question from Caitlin Morse PMP in her article on LinkedIn, among other questions, below. What happens when your DPC doctor is sick or goes on vacation? What does Plum Health use for EMR/EHR if not a system designed to optimize billing? Would this model break if all of the patients currently on Medicaid were switched to this model? The difference between Direct Primary Care and Concierge Medicine. What about childhood vaccinations? Public health facilities won’t vaccinate people with any insurance, even if self-pay. I was quoted thousands of dollars for out-of-network vaccines. These are included with every insurance plan at the PCP - are they included with DPC? How does this model handle malpractice insurance/liability? Does more of a focus on preventative care expose primary care doctors to greater liability? Could DPC provide follow-up for cancer patients in remission, stroke patients post-rehab, post-acute care, etc? The claim is made that 80-90% of what the average patient needs could be addressed by a family physician at a DPC facility, but it would be helpful to understand what that number really represents and how it compares to the current use of PCPs. Is that 80-90% of a patient’s lifetime health needs or 80-90% of what the average patient goes to the doctor for in a single year? Or everything that 80-90% of the population need from a doctor? What percentage of healthcare costs does this represent? Who are the people who use Direct Primary Care Services? What are their income levels? Why should a family sign up for Direct Primary Care? These are questions that folks have about Direct Primary Care and how they can use these DPC services and benefit from them, so I’m happy to take the time and answer them. Thanks for reading and watching, and have a wonderful day. This week, we were featured on the DocPreneur Podcast, which is created and distributed by Michael Tetreault, Editor-in-Chief of the Direct Primary Care Journal. After publishing the book, Direct Primary Care: The Cure for Our Broken Healthcare System, Michael reached out about having me on the podcast. I’m sincerely happy to share my experiences in Direct Primary Care, to teach and inspire other doctors to take this journey to an authentic, fulfilling practice of medicine, to become the doctors they were meant to be. This is one of the biggest reasons why I continue to get the word out about Direct Primary Care - I believe in this model and its ability to transform our healthcare system in the United States. I want to personally thank Michael Tetreault for being on the vanguard of Direct Primary Care by creating educational materials for DPC doctors. Enjoy the podcast, and let me know what you think! To read our book on Amazon, click this link. In October, I had a great opportunity to speak at the Detroit Public Library about health care. The focus of my talk was our Family Medicine practice in Southwest Detroit called Plum Health DPC. The DPC stands for Direct Primary Care and our mission is to make healthcare more affordable and accessible for everyone. This talk was well attended by Detroiters and Library Patrons who wanted to learn more about lowering the cost of their health care. Folks in Detroit and across America are facing ever-rising costs for health insurance premiums and prescription drugs, ER visits and lab work. One such Detroiter showed me the bill from a recent ER visit, which illustrates the inflated cost of medical care, especially the medical care delivered in emergency departments. A Detroiter shows me their medical bill, showing the inflated costs of a chest x-ray, breathing treatments, blood work, and an EKG. Shared with permission. So let’s run through this bill and demonstrate the inflated costs of health care services when you receive them through the emergency department. This person was charged $120 for a Basic Metabolic Panel, a test that costs $6 in our office. This person was charged $47 to check their Magnesium level, and it’s $10 in our office. This person was charged $57 for an EKG in the emergency department, and it’s $2 in our office. A 2 view x-ray in the Emergency Department cost this person $107, but it can be obtained for $38 in the community. Worst of all, this Emergency Department visit was billed out at a Level 5, or the highest level of severity for any emergency department visit. This would be on par with a stroke, heart attack, or gun shot wound. Because of this high level coding, this person was charged $1,204.00 for this visit, which was an asthma attack. At Plum Health, we value price transparency, and we want to make sure that folks understand the costs of their medical care before those services are rendered. This prevents people from being sent to medical bankruptcy, the leading cause of bankruptcy in the United States. This is why I get out into the community and speak at different events - I want to educate folks about how they can live healthier lives and prevent financial calamity in the process. Want to take a deeper dive? Read our book, published on Amazon. Paul Thomas MD at the Detroit Public Library speaking about Direct Primary Care. Paul Thomas MD of Plum Health DPC speaks at the Detroit Public Library about Direct Primary Care and making health care more affordable and accessible. This week, I was invited to speak at Michigan State University College of Osteopathic Medicine regarding Direct Primary Care. It was a neat experience because the school has three campuses and my lecture was simulcast to the other two campuses. I spoke at the Detroit location (did you know that Michigan State University has a medical school campus in Detroit?) and the talk was broadcast to the East Lansing and Macomb campuses. The lecture was an hour, and in the first 45 minutes I discuss the current crisis in primary care, I define Direct Primary Care, and then I give real-world examples of how Direct Primary Care is working in our clinic in Southwest Detroit. During the last 20 minutes, I answered as many questions as I possibly can. I love speaking with students about our healthcare system and about Direct Primary Care because I see the lightbulb go off - I see them ‘get it’ and understand the model and why it works well. I love witnessing that moment - the “aha” moment. A few students bought my book about Direct Primary Care after the event and the pictures below are of me signing the book. Thanks for reading and have a wonderful day. Signing a book for one of the Michigan State University College of Osteopathic Medicine Students. Dr. Paul Thomas MD of Plum Health DPC signing the book, Direct Primary Care: The Cure for Our Broken Healthcare System after a speaking engagement at Michigan State University College of Osteopathic Medicine in Detroit, Michigan. They said it couldn't be done. It wouldn't be possible to fix our broken healthcare system. It wouldn't be possible to fix a healthcare system that undervalues primary care and human relationships. But here we are, a courageous group of primary care doctors, tirelessly working to create value for our patients in communities across the country. This is the story of the Direct Primary Care movement, and how it could revolutionize not only primary care, but the entire healthcare system. The book begins by describing the current crisis in primary care and goes on to define the scope of Direct Primary Care. It closes with concrete examples of how the Direct Primary Care model is working at Plum Health DPC in Southwest Detroit. It’s been a long journey from “idea” to “published”, and there’s still a lot of work to do promoting the book and getting it out into the world. I wrote the book because I believe that healthcare should be affordable and accessible for everyone, and I also believe that the Direct Primary Care model gets us closer to that goal. So, in the book, I set out to explain and describe the ethos of the Direct Primary Care movement and the work that I do in SW Detroit with Plum Health DPC. Screenshot from Amazon.com with the Kindle version of the book. Direct Primary Care: The Cure for Our Broken Healthcare System. Screenshot from Amazon.com with the Paperback version of the book. Direct Primary Care: The Cure for Our Broken Healthcare System. Within 72 hours, these titles will be merged into one page on Amazon! Dr. Paul Thomas is a board-certified family medicine physician practicing in Southwest Detroit. His practice is Plum Health DPC, a Direct Primary Care service that is the first of its kind in Detroit and Wayne County. His mission is to deliver affordable, accessible health care services in Detroit and beyond. He has been featured on WDIV-TV Channel 4, WXYZ Channel 7, Crain's Detroit Business and CBS Radio. 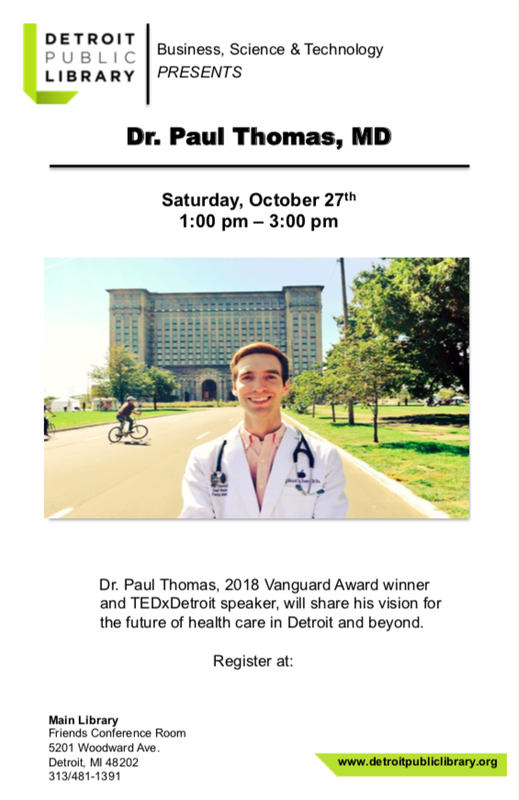 He has been a speaker at TEDxDetroit and is a graduate of and Clinical Assistant Professor at Wayne State University School of Medicine. You can find out more at PlumHealthDPC.com. It’s pretty neat and motivating to get working on the next book! I have a lot of ideas that I want to write about, mostly involving Direct Primary Care, and this was such a cool process. 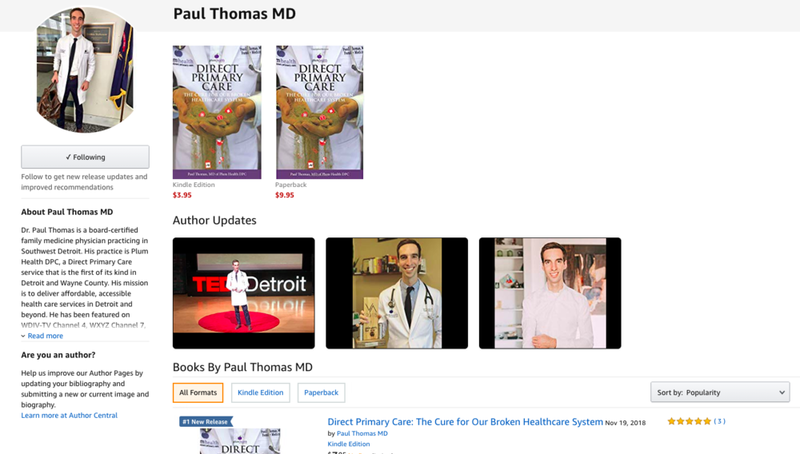 The Author Page for Paul Thomas, MD on Amazon.com. I wrote the book in about one week in January 2018. I thought I’d have it published in March. Boy was I wrong! After writing it, I sent the draft to some brave alpha readers, who read it and gave me feedback. That brought me to February. I then edited the draft with those suggestions and came up with a second draft, which I sent to some beta readers. From there, Amanda and I edited the entire book and had the final draft. This was March. I still needed a cover design, formatting, promotional quotes from people I knew, and so many other things that I was naive to prior to starting this process. In the spirit of Thanksgiving, I have a million people to thank, from those alpha readers to those who helped me design the cover through those who wrote blurbs for the book and my publisher. It definitely took a village to get this over the finish line. A very special thank you to Zain Ismail for writing the foreword. 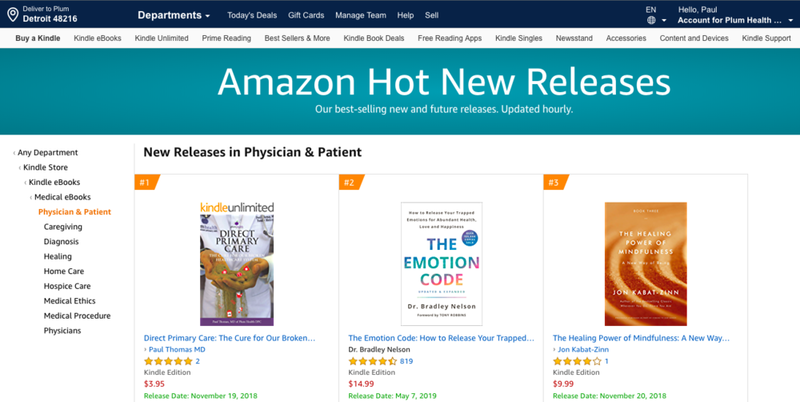 Direct Primary Care: The Cure for Our Broken Healthcare System trending in Medical eBooks “Administration and Policy”. Thanks so much for reading, I appreciate all of you, and enjoy the book! Last month, I had the opportunity to speak with over 100 students and residents interested in the specialty of Family Medicine. This was at the aptly named “Michigan Future of Family medicine Conference” hosted by the Michigan Academy of Family Physicians. The event was held at Michigan State University and hundreds of students were able to attend on a Saturday morning in October. The invitation for the fifth annual Michigan Future of Family Medicine Conference, hosted by Michigan State University and the Michigan Academy of Family Physicians (MAFP). 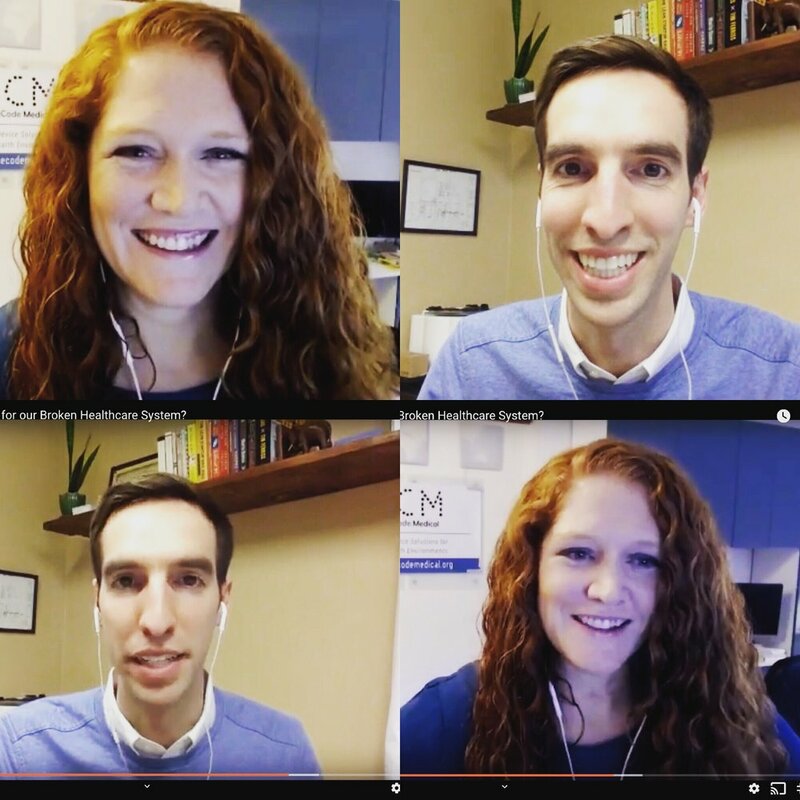 For students, it can be hard to get excited about the future of Family Medicine. Family Physicians work long hours, have to deal with tons of insurance bureaucracy and red tape, and earn less than their colleagues in other specialties. It can leave students deflated. However, I find that when I speak about Direct Primary Care and the opportunities that a DPC model of care can provide, students are energized and excited about the future of family medicine. You see, Family Medicine Doctors have the most tools in their tool set and can have the biggest impact on the community level - we lower admission rates to hospitals and decrease the cost of care for our patients. We also lower the rates of disease and death rates from disease. But, as mentioned previously, Family Medicine is less desirable from the student’s perspective as it pays less and is a difficult job because of insurance hassles. I think our profession, Family Medicine, is at a real moment of crisis, but also at a crossroads for opportunity. We can continue to be a part of the healthcare industrial complex, billing and coding, racking up charges on our patients, or we can adopt the Direct Primary Care model and serve our patients and our community with affordable and accessible health care services that are more just and compassionate in their delivery. That’s my message, I’m glad to have had the opportunity to share it, and I’m very happy to have seen it resonate with so many energetic and eager medical students and residents. I had the pleasure of speaking to an audience of over 100 + Medical Students and Medical Residents at the Michigan Future of Family Medicine Conference in October 2018. I shared the stage with Dr. Sheala Jafry, Dr. Fatin Sahhar, and Dr. Amy Keenum. The event was held at Michigan State University and hosted by the Michigan Academy of Family Physicians (MAFP). This week, we ran an advertisement on WDET with the Corktown Business Association. I have been a long-time fan, listener and supporter of WDET and it’s one of the best places to advertise for our business because the people who listen to WDET are those who think and care deeply about Detroit and the issues facing the city. Also, WDET does an excellent job of informing the public about important issues of the day and it’s a great platform for community-level information and journalism. At Plum Health, we are addressing the lack of health care and primary care resources in the City of Detroit, and we know that this mission resonates with people who care about the city and its future. As a part of the Corktown Business Association, we work with other business owners in the neighborhood to make it a better place to live, work, shop, eat, play, and be healthy. I’m proud to be in the Corktown Business Association and I’m glad we had the opportunity to tell the story about a wonderful place to be with vibrant businesses, Corktown Detroit. This week, I was able to speak at the Oakland University William Beaumont School of Medicine to a group of about 50 enthusiastic first and second year medical students on September 24th, 2018. This presentation focuses on the philosophy and practice of Direct Primary Care and the main points of a DPC practice. I believe in Family Medicine and I believe in Family Medicine doctors and their ability to fix our broken healthcare system, to remake it into a compassionate, intuitive system that delivers comprehensive care. Because of this belief, I speak as often as I can to medical students, residents, doctors, and allied health professionals about Direct Primary Care and its transformative power in our healthcare ecosystem. Last week we attended Detroit homecoming at the Lexus velodrome sponsored by Crain’s Detroit. It was an event that brought together small business owners in Detroit and members of the Detroit expat community. First of all, the Lexus velodrome is a really cool and exciting venue! It is a four lane track and there were cyclists racing at certain points of the event which was cool to see. In the middle of the track was a spectator spot with a bar and meeting areas for the small business owners, journalists, and members of the expat community to enjoy. Around the track there was booths for small businesses to set up and that is where we has the opportunity to interact with each other and the expats. The evening programming/after party was held at the Corner where they had a live band and an opportunity to get onto the historic Tiger’s stadium surface and hit some dingers! In closing this was another fantastic event and a sign of the momentum in the Detroit entrepreneurial ecosystem. Dr. Paul Thomas, MD of Plum Health DPC at the Crain’s Detroit Homecoming Event at the Lexus Velodrome in Detroit, Michigan. This week, our clinic Plum Health DPC was interviewed by the journalists at Channel 7 Action News in Detroit. The piece will be airing on Monday September 24th at 11 pm, after the season 2 premiere of “The Good Doctor”. This will air on Channel 7 in the Greater Detroit television market. I was very impressed by the depth of questioning and level of examination our Direct Primary Care practice received during the course of the filming and interviewing. The journalists at Channel 7 WXYZ Detroit did a phenomenal job of learning about our practice and what makes us unique. They went into great detail about the membership pricing, the wholesale medications, at-cost labs, and at-cost imaging services. I came away with a greater understanding and appreciation for how much work goes into each and every segment that we watch on the local news and I am so excited to see the final piece, tonight at 11! To make an appointment, call 313.444.5630. To enroll online, go to this link. To learn more, check out our main webpage. Full Video from WXYZ Channel 7 News Featuring Dr. Paul Thomas of Plum Health DPC. Dr. Paul Thomas speaking about Branding and Marketing your Direct Primary Care practice at the American Academy of Family Physicians Direct Primary Care Conference in Indianapolis, Indiana. Seriously, I had an amazing opportunity to speak directly with my Direct Primary Care colleagues about Branding and Marketing your Direct Primary Care practice at the American Academy of Family Physicians Direct Primary Care Conference in Indianapolis, Indiana. I believe that our family physicians are the backbone of the health care system in America, and I am encouraged and enthused by their willingness to step into their own power and create ideal practices that optimally serve their individual patients and their greater communities. I'm all in on helping my colleagues create their best practices and to become the doctors they were meant to be. One of the biggest challenges that doctors face is in the realms of branding and marketing as most family physicians have little or no training in these areas. What I conveyed in my lecture was how to create a brand, engage in branding your practice, and actively market your practice. I'm posting about this again because I'm that amped up and because the lecture is now live on the AAFP website, here. Thanks for reading and for watching! Below are some bonus screenshots from the talk. If you're an individual looking for this type of care for yourself, your family, or your employees, please call me at 313.444.5630 or send me an email at paul@plumhealthdpc.org. If you're a DPC doctor and you need help branding and marketing your practice, reach out to me because I'm happy to help. I am so excited for this weekend! I'll be speaking at the Michigan Academy of Family Physicians annual conference on Saturday morning. The title of my presentation is "Direct Primary Care: Barriers to Adoption and How to Overcome Them." The lecture will be held at Western Michigan University and will start at 8:10 am. I am speaking because I believe that we have a unique opportunity to remake our healthcare system into one that is truly compassionate, and one that benefits all parties involved - namely patients, their families, their physicians and allied health professionals. I am so enthusiastic about Direct Primary Care because it removes the middle men and barriers between patients and their doctors, and allows for a restoration of the doctor patient relationship. It also lowers costs on everything from office visits, to lab work, medications, and imaging studies. If you're available, please join me for this lecture, Saturday July 14th at 8:10 am in Kalamazoo, Michigan. Yesterday was a momentous occasion - Ford Motor Company announced their purchase and their plans for the historic and beautiful Michigan Central Station. The Michigan Central Station has been abandoned since the mid-1980's, and it has been an eyesore on the Detroit skyline for the past 20 years. The empty station had been an emotional thorn in the side, constantly nagging at Detroit, reminding Detroiters of their past prominence, but also standing as a signal of our post-industrial economic failures. But all of those bad feelings have been erased after today's event. Now, there's a sense of pride that Detroit has an opportunity to remake this historic site in the best way possible. The event at the Michigan Central Station felt inclusive, as community leaders from several different sectors were invited to be seated on stage. There's also the impending economic impact of having thousands of Ford Motor Company employees working out of the Michigan Central Station in about 4 years. As a lover of Detroit, Detroit history, and architecture this was a great day for me. As someone who cares deeply about the health of Detroiters and the prosperity of the region, this was one of the best days for me. I am hopeful that the benefits of having Ford Motor Company in Detroit will be felt and experienced by all Detroiters - employment and economic prosperity is a key to having great health. As a physician and a family doctor in Southwest Detroit, with our office just two blocks behind the historic and now revitalizing Michigan Central Station, I'm excited for the future challenges and opportunities. 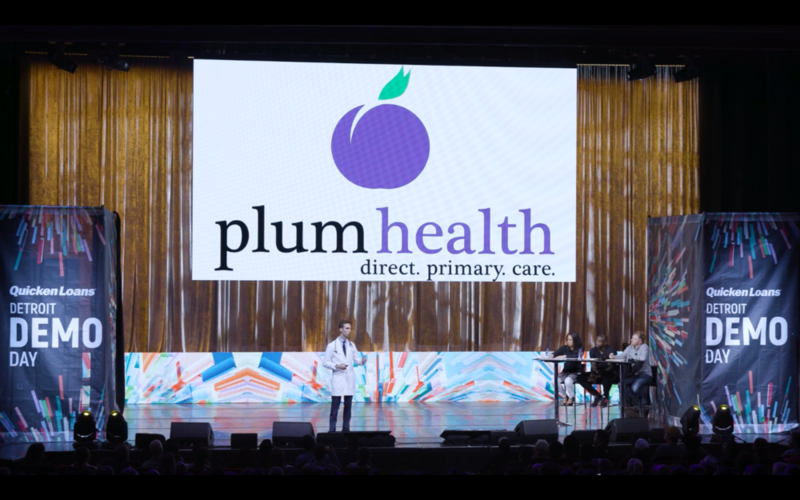 Plum Health DPC will pitch at Detroit Demo Day, and there's $100,000 on the line! That money goes to the top vote getter, so we need to pack the house and get a lot of votes - help us make health care more affordable and accessible. Be in the audience, cast your vote, get your tickets here! Also, there's a ton of news coverage about the event, from Crain's Detroit Business, to the Detroit News, and even the Seattle Times! Thanks for reading, and have a wonderful day! This week, I was delighted to see Plum Health DPC mentioned in two different publications. The first was an excellent, comprehensive piece on Direct Primary Care in Business Insider by Lydia Ramsey. Ms. Ramsey and I have spoken over the phone about the Direct Primary Care movement, and she asked several insightful questions about our practice in Detroit, Michigan. She has spoken with roughly 16 other DPC doctors and synthesized a great summary of the movement in her article. Next up, we were mentioned in the South Florida Sun-Sentinel article on Direct Primary Care written by Ron Hurtibise. The article discusses Direct Primary Care and the efforts in the Florida Legislature to make DPC 'legal' in that state. Fortunately, in Michigan, Direct Primary Care has been 'legalized' via the efforts of State Senator Patrick Colbeck and his Senate Bill No. 1033. I have placed legal and legalized in quotations above because practicing Direct Primary Care or retainer-based medicine is not illegal, but having laws on the books like Senate Bill No. 1033 in Michigan and the proposed HB 37 in Florida removes any potential legal challenges and allows doctors who want to practice DPC medicine a clear path. "As to the charge that Direct Primary Care contributes to the shortage of primary care doctors, Paul Thomas, a doctor with Plum Health DPC, wrote in an essay published on LinkedIn.com last year that the model might actually encourage more medical students to become primary care doctors, rather than pursue higher-paying specialty fields. "A Direct Primary Care practice with 500 members can provide a primary care provider with more income than some earn with 3,500 patients at a fee-for-service practice, Thomas wrote. And the increased time for personal interaction eliminates “role strain” and allows the provider to address patients as whole people, he said. I believe that Direct Primary Care practices provide physicians and patients with a better primary care experience, and will allow doctors to practice for longer periods of time without retiring early or leaving the field completely because of burnout. I'm happy to see the DPC movement spreading across the country, and I'm happy to be quoted in these two publications.